The Sega Genesis will always hold a special place in my heart, and of its library, few games were more beloved than 1993’s Mutant League Football. It was EA’s anti-Madden by being unapologetically zany and never letting strategy stand in the way of a good time. So, when Digital Dreams announced it was making a spiritual sequel, I was shocked since today’s sports games often take themselves way too seriously, bogged down by competitive online leagues and consumer demand for the tightest graphical and gameplay realism. 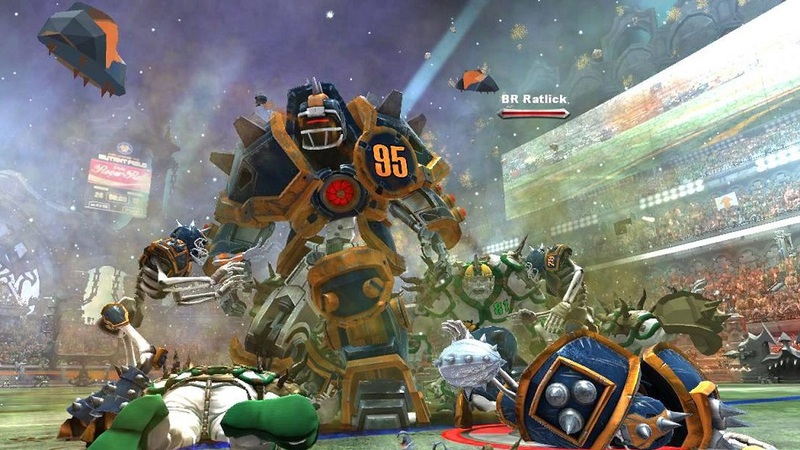 An even bigger shock than its mere existence, however, is how terrific Mutant Football League is. (And also, what Digital Dreams got away with.) In essence, it’s a simplified version of Madden and unabashedly reverent to current teams, players and stadiums. It’s so darn clever in doing so, however, I’m guessing that the NFL let it get away with it as a result. Who’s the greatest player of all time? Why quarterback Bomb Shady, of course, who plays for the Nuked London Hatriots. But it’s only fun and games until the Malice Hellboys and Shriekial Helliot come to town. Want to relieve the heart-stopping Mayhem Bowl? Sick Souls of the Killadelphia Evils is ready and waiting to prove doubters wrong. Being Mutant League, teams are comprised of skeletons, ogres, demons and robots, big and small. Size does matter, as the type of damage one can inflict on opponents is perhaps the most critical factor in a game. Kill enough of the opposing team’s star players and the pendulum swings considerably, so players will whack each other endlessly in hopes of knocking down life meters while deadly stadiums capture the essence of their would-be respective cities via custom traps and hazards that are indicative of team name and locale. If stuff like this wasn’t already irreverent enough, things get really crazy when stadium nuances combine with trick plays that would only be possible here. During one match, my running back eyed a route through some fire pits to take out a chasing safety, except the opposition smartly elected a thunder clap trick play at the snap — and yes, it was literally a storm bolt which shocked the runner and freed the ball. Another defender recovered only to get knocked dead by the opposition, which triggered a second fumble. The offense picked it up, but then… got eaten by a giant sand worm. Amazingly, the play-by-play captured all of this in real time, with terrific quips and inside jokes. Be warned, though — vulgarity does appear in commentary, but can be turned off in the options menu. Oh, and the halftime show? Look forward to controlling a player running for his life from referee zombies while hoping to survive for 30 seconds. While this is all good so far, my primary criticism with Mutant Football League is about the slightly muddied graphics. This becomes an issue in bunched-up running or passing plays when it can be difficult to distinguish who’s who. This can lead to missed coverage or catches, and also to unnecessary struggles to gain yards on the ground. It becomes less of a problem over time once the player gets used to it, but it’s still a noticeable wart that must be forgiven before one can fully enjoy the game. A lesser criticism apart from the visuals is that the game may appear to be a one-trick pony to those unfamiliar with the original 1993 version. To those with no nostalgia for it, I could imagine Mutant Football League seeming like nothing more than a watered-down version of Madden with an idiosyncratic sense of humor. 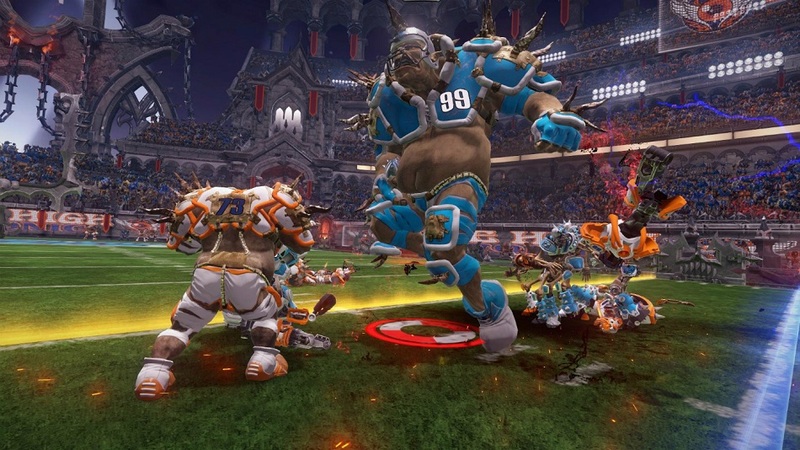 One final thing to note — for me, the greatest draw of Mutant Football League will always be its online mode, where two friends can have a blast unleashing chaos on each other. Unfortunately, at the time of review, I couldn’t snare a single online opponent. Prospective players should be aware that the online community seems small for this one, so be ready to spend a lot of time playing against the AI unless a friend can be convinced to buy a copy of their own. Disclosures: This game is developed and distributed by Digital Dreams Entertainment. A copy of the game was obtained via publisher and reviewed on PS4. Approximately 12 hours of play were devoted the game’s three modes. Parents: According to the ESRB, this game is rated M and contains Blood and Gore, Drug Reference, Mature Humor, Strong Language, and Violence. Characters can stomp on opponents after tackling them and use weapons to bludgeon or shoot them. Gameplay contains frequent splashes of blood, as well as decapitations/dismemberments with certain weapons. In-game commentary contains frequent instances of mature humor, sometimes suggestive/sexual or drug referenced in nature. The words “f**k,” “sh*t,” and “a*shole” appear in the dialogue. Deaf & Hard of Hearing Gamers: Audio is not required to play this game, and subtitles are available throughout. It’s fully accessible. Remappable Controls: Controls are not remapabble.